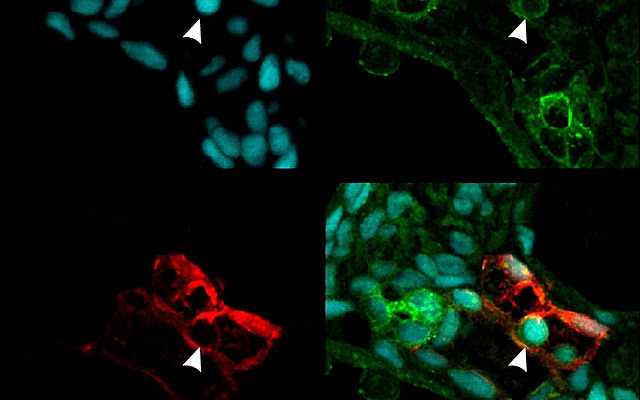 In this multiple confocal analysis of transverse sections from transgenic zebrafish embryos, vasculature is labeled by red fluorescence, NF-kB protein complex that regulates inflammation by green fluorescence and nuclei by blue fluorescence. The arrowhead indicates a potential hematopoietic stem cell emerging in the dorsal aorta with high expression of NF-kB. The image at bottom right combines all channels. Hematopoietic stem cells (HSCs) give rise to all blood and immune cells throughout the life of vertebrate organisms, from zebrafish to humans. But details of their genesis remain elusive, hindering efforts to develop induced pluripotent stem cell (iPSC) replacements that might address a host of blood disorders. In a paper published Nov. 20 in the journal Cell, researchers at the University of California, San Diego School of Medicine describe the surprising and crucial involvement of a pro-inflammatory signaling protein in the creation of HSCs during embryonic development, a finding that could help scientists to finally reproduce HSCs for therapeutic use. Traver and colleagues specifically looked at the role of a cytokine (a type of cell signaling protein) called tumor necrosis factor alpha or TNFα, which plays a pivotal role in regulating systemic inflammation and immunity. The work extended previous research by Spanish biologist Victoriano Mulero, who had reported that TNFα was important in the function of the embryonic vascular system and that in animal models where TNF function was absent, blood defects resulted. The Cell paper’s first author Raquel Espin-Palazon, a postdoctoral researcher in Traver’s lab and a former colleague of Mulero’s, determined that TNFα was required for the emergence of hematopoietic stem cells during embryogenesis in zebrafish – a common animal model. Traver said the finding was completely unexpected because HSCs emerge relatively early in embryonic formation when the developing organism is considered to be largely sterile and devoid of infection. The newly discovered role of TNFα in HSC development mirrors a parallel discovery regarding interferon gamma (INFg), another cytokine and major mediator of pro-inflammatory signaling, highlighting multiple inputs for inflammatory signaling in HSC emergence. Traver said the crucial roles of TNFα and INFg in HSC emergence are likely similar in humans because of the highly conserved nature of HSC development across vertebrate evolution. Co-authors include David L. Stachura, UCSD Department of Cellular and Molecular Medicine and California State University; Clyde A. Campbell, Natasha Del Cid and Albert D. Kim, UCSD Department of Cellular and Molecular Medicine; Diana Garcia-Moreno, Segio Candel, Jose Meseguer and Victoriano Mulero, Universidad de Murcia, Spain. Funding for this research came, in part, from the Spanish Ministry of Science and Innovation, the Fundación Séneca, Agencia Regional de Ciencia y Tecnología de la Región de Murcia, the National Institutes of Health (grants K01-DK087814-01A1 and R01-23DK074482), the California Institute for Regenerative Medicine and the American Heart Association.